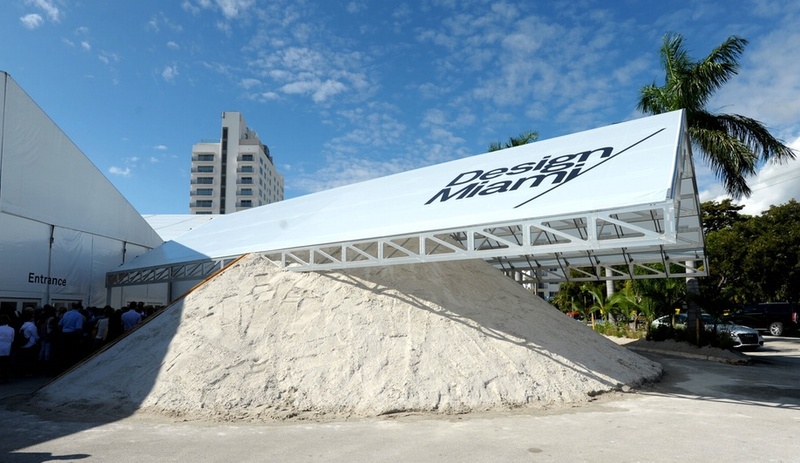 Formlessfinder's pavilion at Design Miami comprises a milled aluminum canopy perched on a five-ton pile of sand. A timber retaining wall supports the side of the sand pile which faces the main entrance. On the other side of the retaining wall, outside the entrance to the fair's main building, the canopy acts as a porte-cochère that shelters attendees. 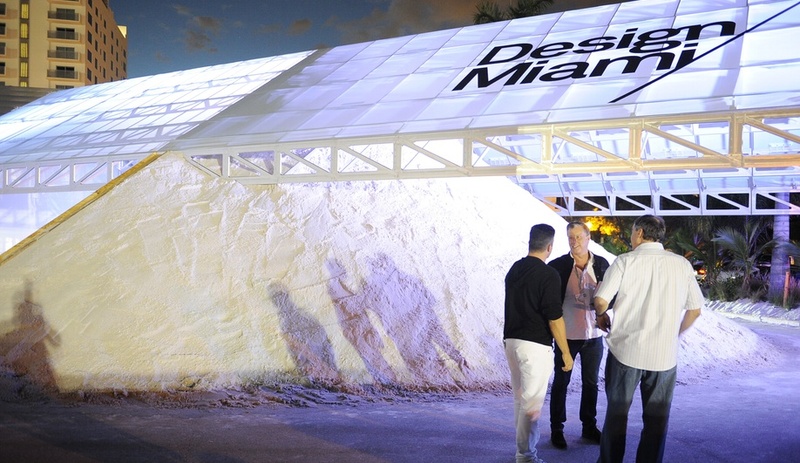 After Design Miami, the components can be easily de-installed and reused as needed. 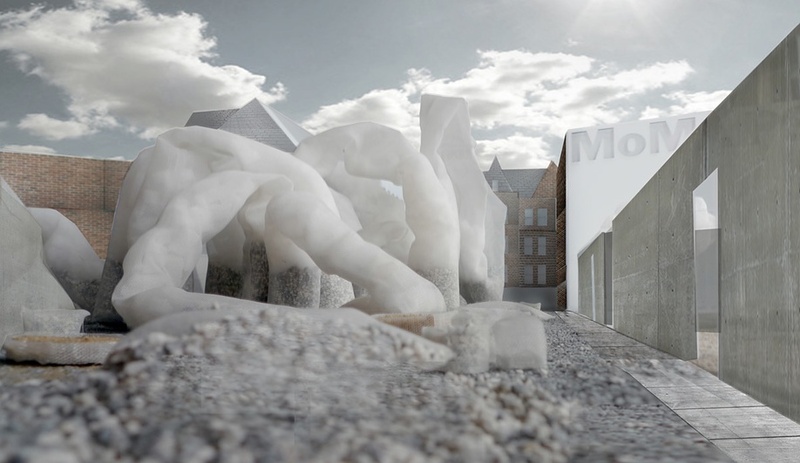 Formlessfinder's proposal for the MoMA PS1 courtyard comprised flexible looping pillars of mesh anchored with ballast. 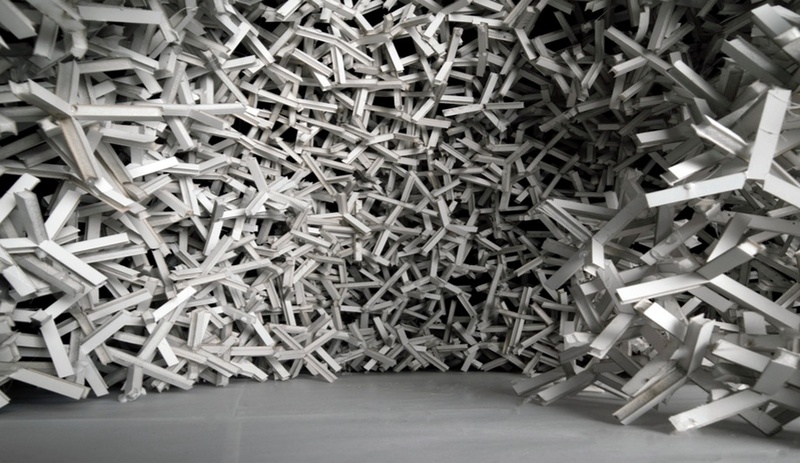 Burr proposes a loose structure made from discrete but intersecting objects. 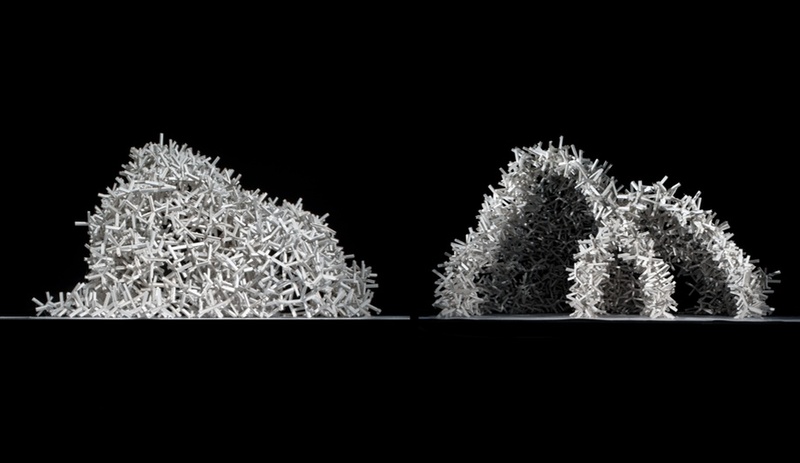 The interior of the Burr proposal illustrates the dynamic possibilities for structures created from randomly assembled objects within architect-determined parameters. In this model for a slab-roofed structure entitled Load Test, traditional pillars are replaced by taluses formed from different types of aggregate. Tent Pile, as it’s called, features a carefully calibrated canopy of glass and milled aluminum that cantilevers over a massive pile of sand partially bulwarked by a hidden retaining wall. 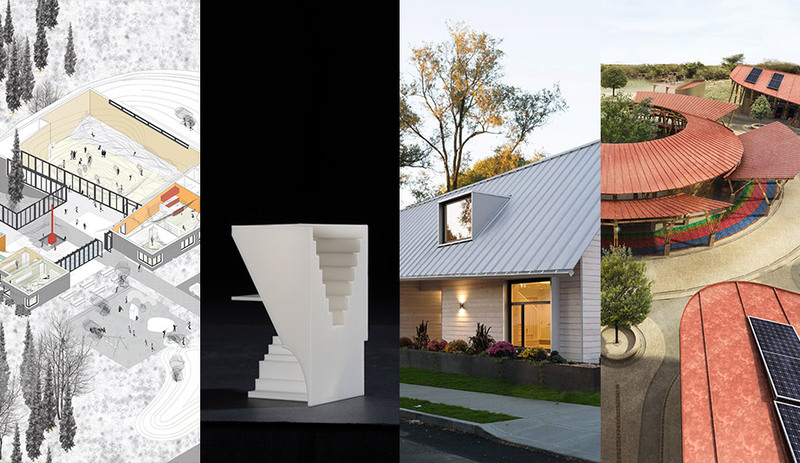 It’s a combination that exemplifies Formlessfinder’s passion: functional and site-responsive architecture that places materials and processes ahead of the pursuit of pure form. 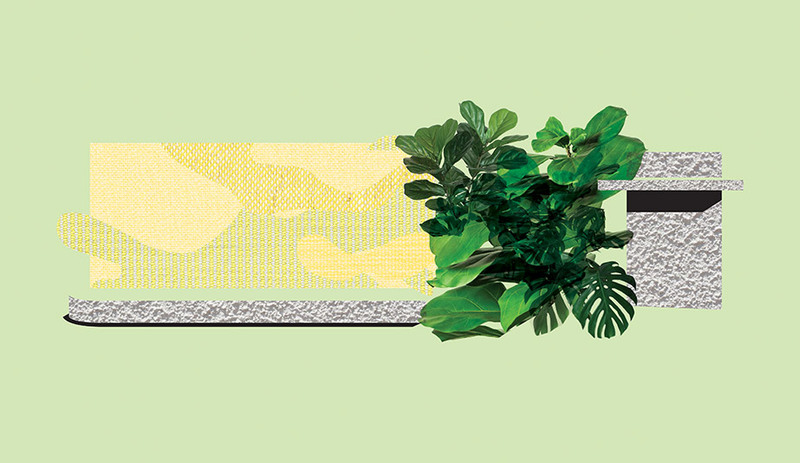 We spoke with the firm’s principals, Garrett Ricciardi and Julian Rose, about their Miami installation, and the delicate balancing act of letting the materials take over. What’s the idea behind Tent Pile? 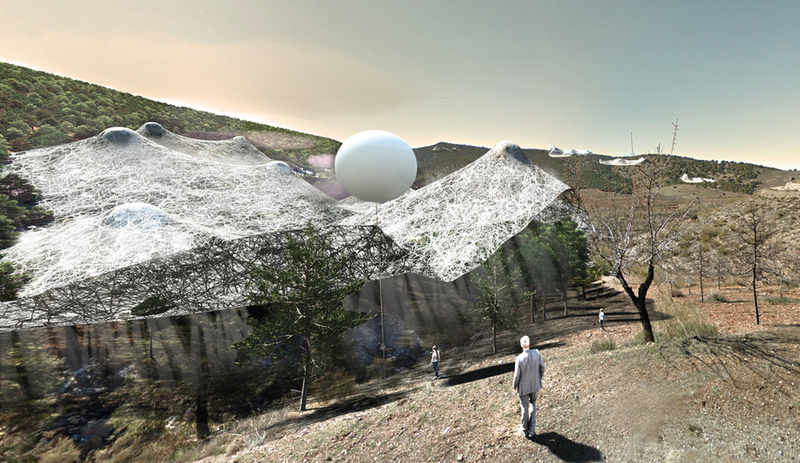 JULIAN ROSE: As you can tell, the project certainly has a conceptual bent. This gets to the core of why we call ourselves “Formlessfinder,” and our ideas about introducing formlessness to architecture. 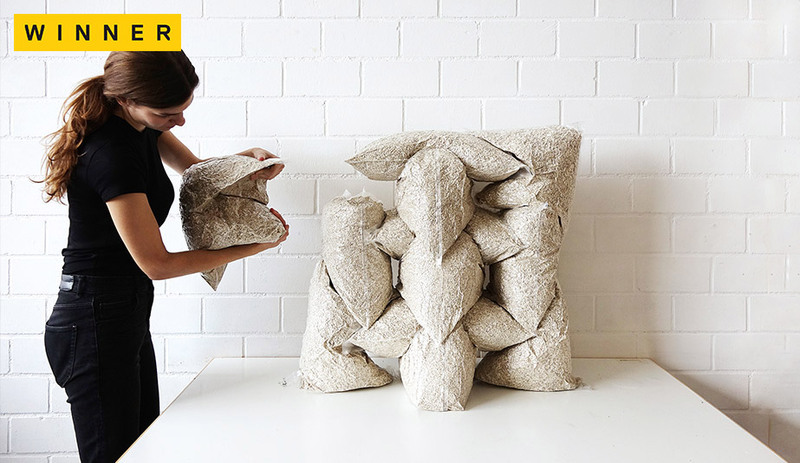 With this project, the idea is to reinvent structure in a way that enables a looser form of control, and the use of loose materials rather than fixed materials. 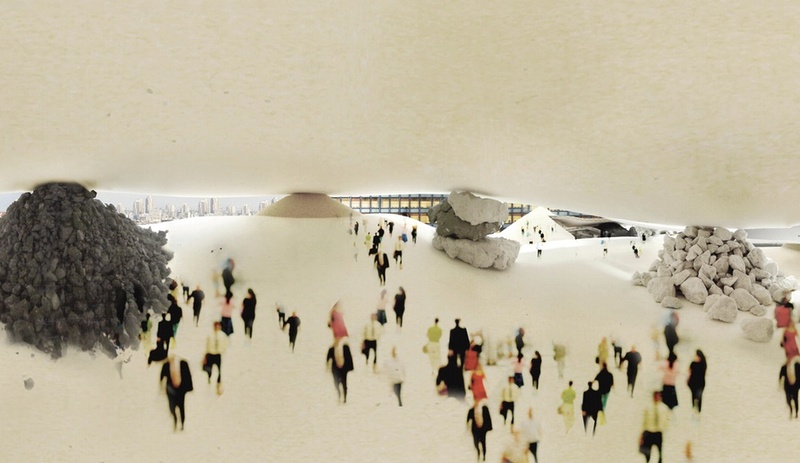 The basic idea is to have a simple roof structure that’s supported on a pile of sand, rather than traditional columns. The idea of creating a cantilever emerged as something we were interested in as a response to the “Miami Modern” tropical vernacular. Typically, to have a cantilever that length, you would need to excavate, pour a concrete footing, have a pretty serious structural foundation. By using the enormous weight of the sand as a counterbalance, we were able to get the structure to work. 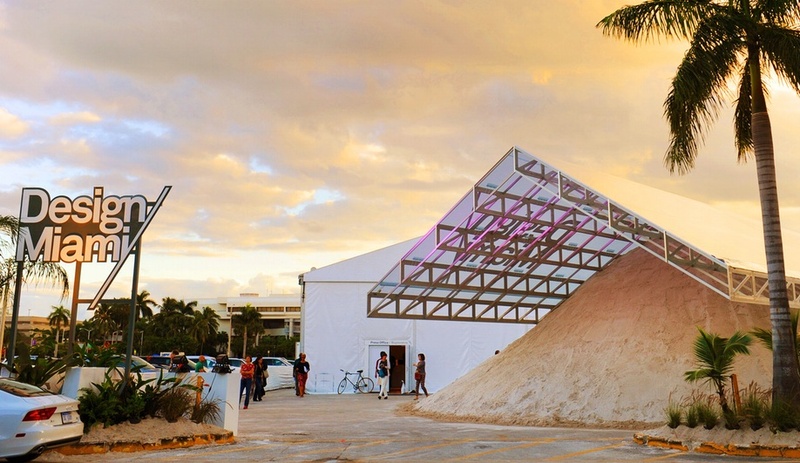 GARRETT RICCIARDI: If you build almost anything in Florida, whether that’s a Walmart, a parking lot, or a Herzog & de Meuron museum, you come up against the problems of dealing with sand. Typically it’s seen as an incredible nuisance; sand is something you have to go to great lengths to control, or build enormous supports to hold a structure up. So if you’re building a vertical tower on sand, you almost have to produce a false bedrock. What we tried to do with Tent Pile is to ask if there are ways to see sand as a plus, something that you could use with the typical technologies that exist around here for moving it around. We worked with someone involved with the Army Corps of Engineers who builds islands and reefs around the area – something that’s done very easily, and already has infrastructural technology. Sand is found on every coast, so this structure or something like it could be viable as a sort of local architecture anyplace that sand existed. How does the project’s temporary status play into the concept? JR: This idea of loose materials has been an ongoing interest of ours, and it is in response to the brief of a temporary structure, which young designers get pretty frequently. We love doing them, but you often have to do something that will be up for a summer, or during a fair or something, so those projects tend toward lightweight canopy structures because of the the de-install issues. So the idea of the loose material, in a way, was trying to come up with something that could have the presence and the materiality and literally the weight of real architecture, but would still be simple from a de-installation standpoint. In general, is materiality a core concern in your projects? JR: Absolutely. Proposing this idea of the formless in architecture, one of our ways of approaching that is not looking towards form but towards process. All materials have very distinct processes and potential for building, and we very much start from the process rather than the form. Unique to the Miami project, questions came up through some of the design charettes with the client and the engineer – “Can you make it taller; can you make it shorter; can you make it wider?” Sometimes it’s very blunt to say “No,” but it is a constraint of sand – no two sand piles are the same, but every time you pile sand it has nearly the exact same angle. The angle of the roof truss and the angle of the pile, which are both 33 degrees and based on local sand samples, was a very fixed element. In many ways, that 33 degrees not only informed the shape, but the process of the pouring and the engineering behind the truss as much as the wall and the pile. How do you navigate the boundary between letting the materials express themselves and setting your own parameters? JR: That really cuts right to the core of what we think is interesting about our practice, or the things we struggle with. The fun part for us, I would say, is precisely balancing that. We both have backgrounds in art. Garrett was trained as a sculptor and I was originally trained as an art historian before we got into architecture, and that informs a lot of our work. Sculpture in different periods has different takes on a kind of “truth to materials” that also informs architecture. But I think there’s one version of it which we would say is really pushing it too far, toward the kind of organic or the biomorphic, which is to almost fetishize the form that emerges naturally but in a way that is just as formal. It’s almost the problem with the Aristotelian version of form. It’s the telos: the idea that in this sand is the perfect shape that will just emerge if only we’re gentle enough with it. For us, it’s a little bit more pragmatic. We’re very interested in using materials and the processes we put them through as a tool to drive the project forward. GR: We think of ourselves working toward using these processes and taking on this theoretical concern in very practical ways. In a way, Tent Pile really is our first proof of that concept. As atypical of a building as it might be, if you get to see it in person, it is actually a very functional structure. I would say that we are very interested in making these strange things, but making them – not practical in the sense of banal, but in taking on function and typical building form. So these are more than experiments? JR: Experimental, but not outside of architecture. We see ourselves working through a kind of technique and strategy that could become part of the field, and hopefully could be integrated into every project. This summer we wrapped up a small house renovation and addition, which is very different from the Miami commission, but still includes these elements: it has not only timber, but loose stacks or informal arrangements of materials. In Tent Pile, you have a 500 ton pile of sand that’s basically sprayed in place with a giant fire hose, and then suddenly that’s meeting a milled aluminum truss that was CNC routered to 1/1000th of an inch tolerance. It’s the game of taking these materials and processes and orchestrating a collision between them and architecture. You still have not only your intentionality as a designer, but also real iconic constraints, real programmatic constraints, and then you see where they all settle out. That’s how I would describe it, and that’s really the fundamental description of our design process. Design Miami runs until December 8.